I'm attempting to connect my PS4 controller to a laptop over the built-in bluetooth. I pair by either holding the ps button and options (which my laptop autodetects and pairs) or holding the ps button and share and then explicitly pairing using "Add Bluetooth or other device". The pair succeeds but when I try to actually connect the controller (by pressing the ps button), the bar flashes then goes off. On the laptop it appears as "Connected" very briefly then immediately switches to "Driver error". I have previously managed to get it to connect without the driver error but it didn't actually work (buttons had no effect). Connecting via USB works fine. Edit: I've now managed to get it to connect without the driver error again but nothing apart from windows' bluetooth devices screen detects it. I've tried updating drivers and multiple reinstalls with no luck. I don't actually own a PS4 (I bought this controller especially to use with my laptop). I'd really appreciate any help as I'm rather short on USB ports. You mentioned you updated the drivers, but DS4 has no official driver on Windows 10 so I assume you are using an unofficial driver like DS4Windows. There was a change to Windows that broke DS4Windows and effectively renders the DS4 device unusable until the user manually re-enables it. To work around this issue, you'll need to re-enable the DS4 and use a patched version of DS4Windows. You cannot use the PS4 controller over Bluetooth without purchasing the "PS4 DualShock USB Wireless Adaptor", or using the USB cable. If you want to save yourself some money, using a USB cable is the easiest option. Unfortunately, either option will take up a USB port on your laptop. 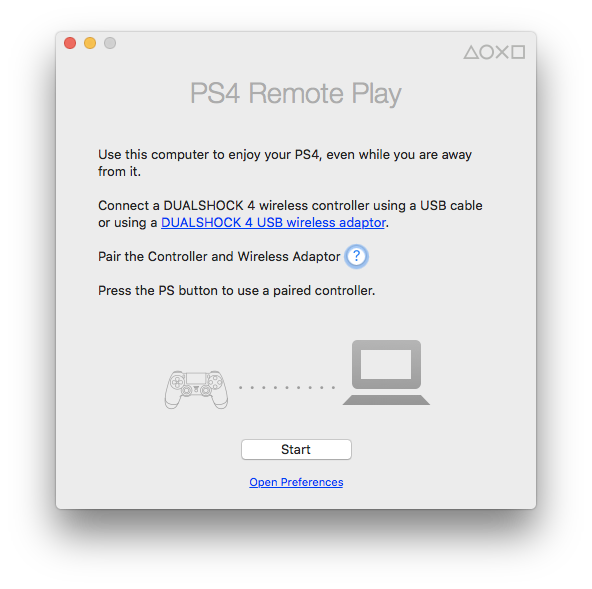 Below is a screenshot from the MacOS version of PS4 Remote Play app, indicating the two ways in which the DS4 will work. The Windows version of the Remote Play app has a similar message. I understand that you may not be using the Remote Play app on your own PC, but the message is a good indicator of what is supported. I have a similar problem on my MacBook. My controller connected successfully at the first time, but failed to connect the next time. The bluetooth preferences interface said that the controller is connected but showed a loading indicator (like it's connecting) and finally failed. I succeeded to fix it by deleting the /Library/Preferences/com.apple.Bluetooth.plist file. Not the answer you're looking for? Browse other questions tagged pc ps4 controllers windows-10 or ask your own question. How to keep PS4 controller connected?